Although the grammatical expression of reciprocal (or ‘mutual’) situations in the languages of the world has received a surprising amount of attention in recent years, so far no comprehensive study specifically dealing with the historical development and synchronic structure of English reciprocal constructions has been published. This book takes into consideration insights from the three major research projects on reciprocity in the languages of the world as well as the rich literature on more specific aspects of reciprocity. Assuming a usage-based model of grammar, the development of the reciprocal strategies used in present-day English is described, with special attention paid to the periods following Middle English, where today’s system began to take shape. The means of expressing reciprocity in today’s English (e.g. the expressions each other and one another) are then analyzed as a system of competing constructions, the make-up and distribution of which can be related both to their history and subtle distinctions in meaning and use associated with the different constructions. Quantitative data from corpora of natural language provides evidence for the analyses put forward. Wherever possible, claims on the expression of reciprocity in present-day English are checked against what is known about the grammar of reciprocity in other languages. 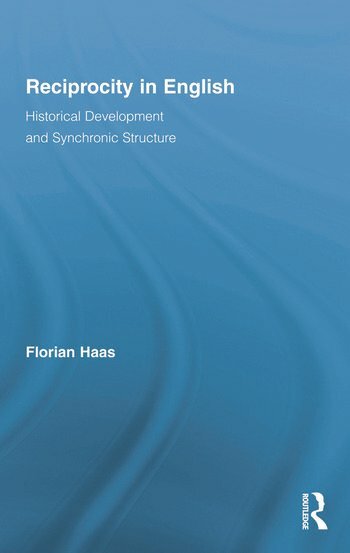 Florian Haas is a lecturer in linguistics at the University of Jena, Germany.